I kept this PSP homebrew game as simple as possible on purpose. The theme I chose was "space-something with simple controls and gameplay". After the long development time of Geoincursion (for Nintendo DS), creating Newton Voyage has felt more recreational by comparison. The gameplay is easy to pick up: press X to launch your ship, and then press UP or DOWN while the ship is within the launch area to aim it. Once it leaves the launch area, it will hopefully float to the goal area to the right. There are two kinds of planets: green ones exert gravity upon the ship and red ones exert "anti-gravity", repelling the ship. 2. Add C:\pspdev\bin to your PATH environment variable. 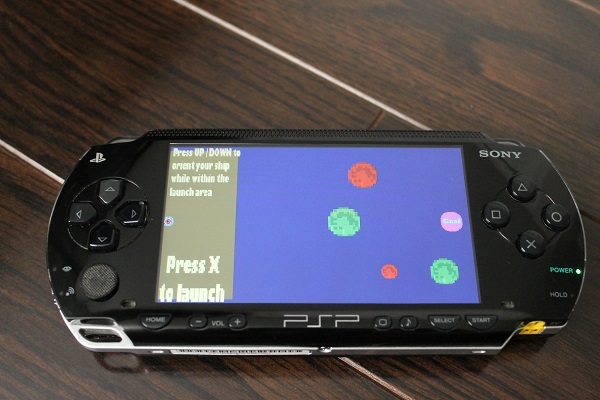 Development was made easier by the fact that the PSP supports OpenGL, which I had used before, back in university. I used the PCSP emulator to test my code. At a point in time, I noticed that the same code behaved wildly different on the emulator and the hardware. After a bit of backtracking, I got it to do the same thing on the two platforms.